Frequenting the Classic & Vintage Motorcycle Auction sites brings up occasional gems about the riders and their motorcycles. The below appeared on the Bonham’s site when Tommy Meeten’s old 172cc Franny B used at Brooklands. 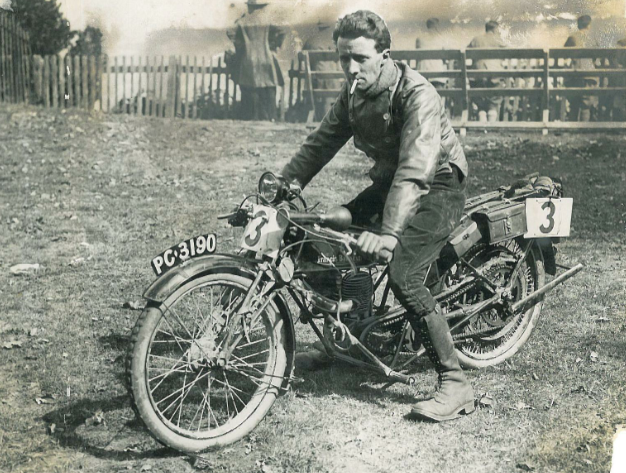 Little is said about the bike but of the photos provided is this off him on a, not so track looking, Franny B possibly originating from 1927 the year he rode a 173 FB in the ISDY, that year based in Buxton where he bagged a Gold Medal. In the mid-1920s, T G ‘Tommy’ Meeten’s name was invariably linked with that of Francis-Barnett, for whom he set a number of speed records at Brooklands riding one of their 172cc Villiers-engined two-strokes. Tommy Meeten’s association with Francis-Barnett had begun in 1924 when he rode a Blackburne-engined model to 6th place in that year’s Ultra-Lightweight TT in the Isle of Man. The Blackburne was, of course, a four-stroke but from then onwards Tommy Meeten’s involvement with the Coventry firm would be restricted to its two-stroke models, which he rode successfully in trials as well as at Brooklands.For Meeten’s Brooklands campaign Francis-Barnett constructed a racer using Villiers’ recently announced 172cc Sports engine, later versions of which featured special expansion chamber exhausts, presaging post-war developments in this area. Villiers was much more actively involved with the production of sports and racing engines in the between-the-wars years than they would be after WW2, and the Sports was the first of a family of 172cc high-performance engines. Riding the special Francis-Barnetts, Meeten set several speed records for the ‘175’ class and won numerous races at Brooklands. Capitalising on his successes, Villiers introduced further evolutions of the Sports engine in the form of the Brooklands and Super Sports TT units.Away from the Surrey track, Tommy Meeten won Silver Medals in consecutive years between 1925 and 1927 at the Scottish Six Days Trial riding 172cc Francis-Barnetts; bagged a Gold in the 1928 event on a Pulman sidecar outfit; and added an International Six Days Trials Gold Medal to his tally at the 1927 event, held that year in Buxton. In the mid-1930s he took over the manufacture of Len Vale-Onslow’s SOS (‘Super Onslow Special’) motorcycles, which he continued to produce up to the outbreak of WW2, advertising them as ‘So Obviously Superior’.In 1929 Tommy Meeten had helped found the British Two-Stroke Club (BTSC), which was based initially at his motorcycle shop in Dorking, Surrey and subsequently at his Meeten’s Motor Mecca dealership at Shannon Corner on the Kingston bypass in New Malden. He was the Club’s president from 1956 to 1974. Like the BTSC, the company he founded still exists (as Meetens Ltd) supplying all makes of industrial engine from premises in Gosport, Hampshire.The machine on offer dates from circa 1927 and has the Villiers Brooklands engine fitted with Meeten’s special expansion chamber exhausts. When Tommy Meeten died, his business partner, Miss Margaret Child OBE (president of the British Two-Stroke Club from 1974 to 1995) contacted the vendor’s father and asked if his son would like it (Meeten was the vendor’s godfather). The father (a Velocette man) was from Dorking and had ridden with Meeten in many trials and scrambles events. The machine was in a sorry state when acquired and was rebuilt by the vendor’s father over the course of a year, circa 1973/74. Since then it has remained in the vendor’s private collection and was displayed at Brooklands in 2007 during the Centenary celebrations and again last year at a revival meeting. There are no documents with this Lot. We are advised by the vendor the machine has been kicked over on a regular basis, and was started earlier this week.